Grep. 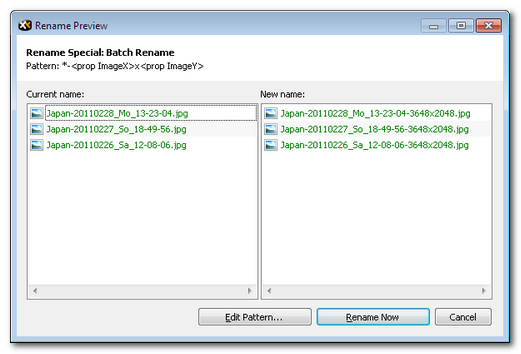 Finding files by content now supports Regular Expressions. 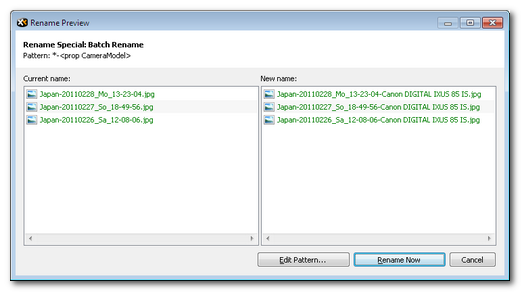 In the Info Panel (F12), Find Files | Contents tab you find a new Mode selector. Select RegExp and the pattern you enter into the contents box is processed as a Regular Expression. A Regular Expression in the Contents field (click to zoom). Rename Special. 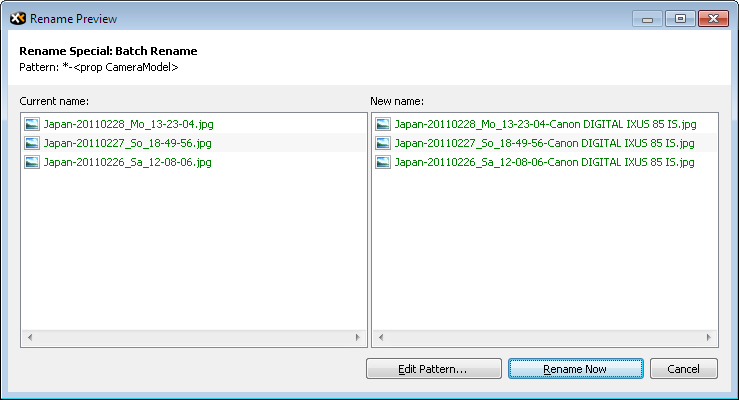 Now you can mass rename files using meta properties like Camera Model, Width and Height, or Bit Rate. This is achieved by the new variable <prop ...> which functionally corresponds to the scripting function property(). It returns any available Shell Property value of the current item. Using scripting you can e.g. 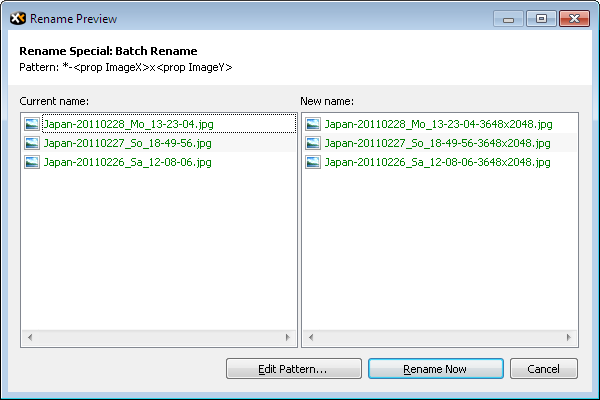 show the Size, Type, and Version of the current item like this: msg "<prop #1>, <prop #2>, <prop fileversion>"; As you can see, numerical as well as verbal indices are supported. Appending Width and Height to the current name (click to zoom). Appending the Camera Model to the current name (click to zoom). User Buttons. Now user-defined colored labels are supported. You can define a short text to be displayed in the toolbar instead of the icon. In the Edit User Button dialog (right-click the button in the toolbar and choose Edit... from the context menu), simply prefix the contents of the Icon field with "label:", for example: label:acdc. Now "acdc" is printed to the button in the toolbar. Optionally you can define text and back colors in format RRGGBB: label:acdc>885577,ffffee. Defining a label for a User Button, with text and back colors (click to zoom). The right-most button is the result of the above configuration. Of course, this also works for Droppable User Buttons (which are just a subtype of User Buttons). Full Screen Preview. Now the mouse wheel is supported.